The Xerox VersaLink C505 is the perfect addition to any office providing a host of time saving features that increase productivity and improve efficiencies. The C505 is 45 pages per minutes and prints in black & white and color. Copy, Print, Scan to Email, Network Scan and Fax come standard on the C505. The C505 is mobile print and cloud scanning ready. Check out additional details on the C505 below and our special promotion for the C505 with 2nd paper tray and stand. This unit is very affordable for every office! 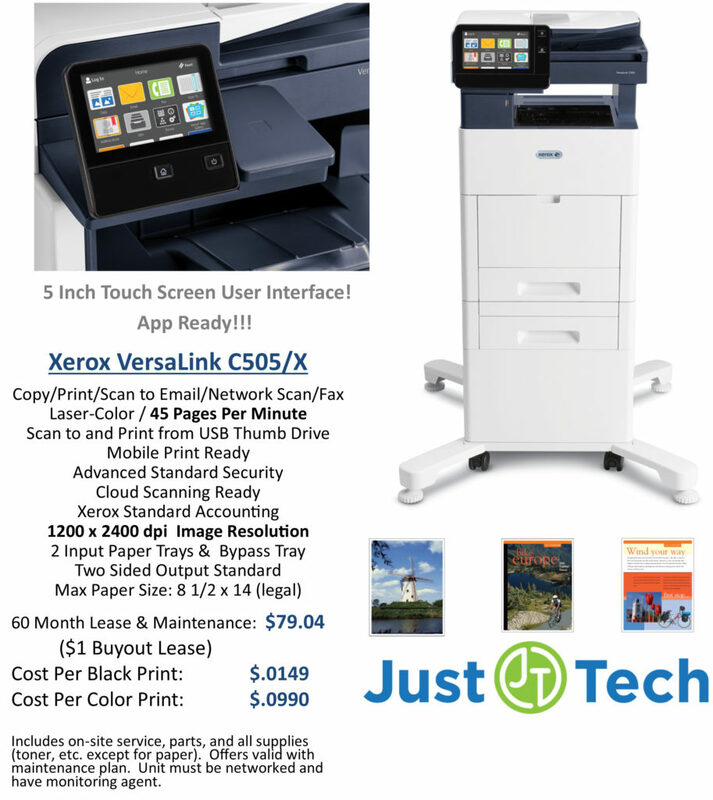 Just·Tech is a technology company founded in 2006 providing office supplies, Print Solutions, Network & IT Solutions, custom Xerox App Solutions, office furniture and office supplies. Through our Print Solutions, we offer sales and support for Xerox copiers & printers. We also provide supplies & service support for HP, Lexmark, Dell and Brother printers. Currently we are managing thousands of copiers & printers making millions of impressions every month. With our Network Solutions, we provide Managed Network Services & IT Support to more than 70 small businesses, non-profits and religious organizations. We specialize in proactive support and provide onsite & remote assistance. Just·Tech is the first Xerox certified Personalized Application Builder Authorized Developer in the United States. With our App Solutions, we create custom apps for Xerox multifunction copiers that increase efficiency and improve workflows. There are more than 20,000 apps that we have created installed on Xerox devices across the globe.